In a resource for the American Evaluation Association, Susan Jenkins reflected about working on evaluation with Native American/American Indian and Alaska Native tribal governments. She points to a resource on evaluation that she found useful in her work with tribal governments, and that I think has a lot of important uses in various cultures. 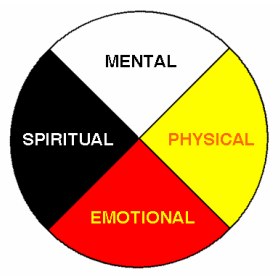 The Medicine Wheel Evaluation Framework, described by the Atlantic Council for International Cooperation, aims to be a more holistic approach to evaluation than our typical models. Most evaluations seek to find out which activities led to which changes, in a very linear way. Just think about a logic model — we may know intuitively that there are feedback loops and bigger pictures that affect our program and our evaluation, but there aren’t great ways to depict that in our logic model framework. Thinking about evaluation in this way might be helpful in many ways. Taking the emphasis off of “proving” desired outcomes and focusing more on experiences can make evaluation more relevant and less intimidating for communities that are distrustful of or intimidated by the evaluation process. It is more storytelling than testing. And it can also provide richer, deeper understandings for evaluators. Read the full guide to learn the history of the framework, what the framework entails, and examples of its application.